Hi there! Let’s play multi-player No Worries at the BlackJack Ballroom online casino gambling. 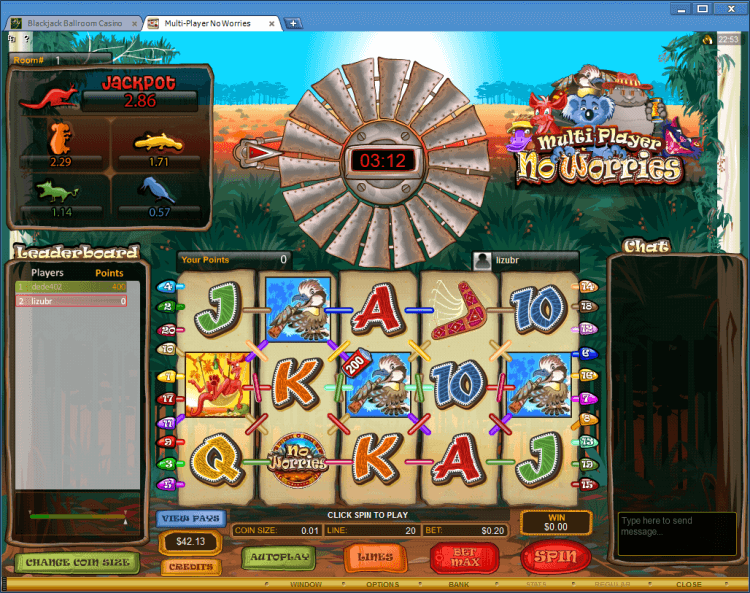 Multi-Player No Worries is a five reel, twenty payline and twenty coin slot machine. This is a common game room where you play with other players and up to 30 players allowed in the common game room. 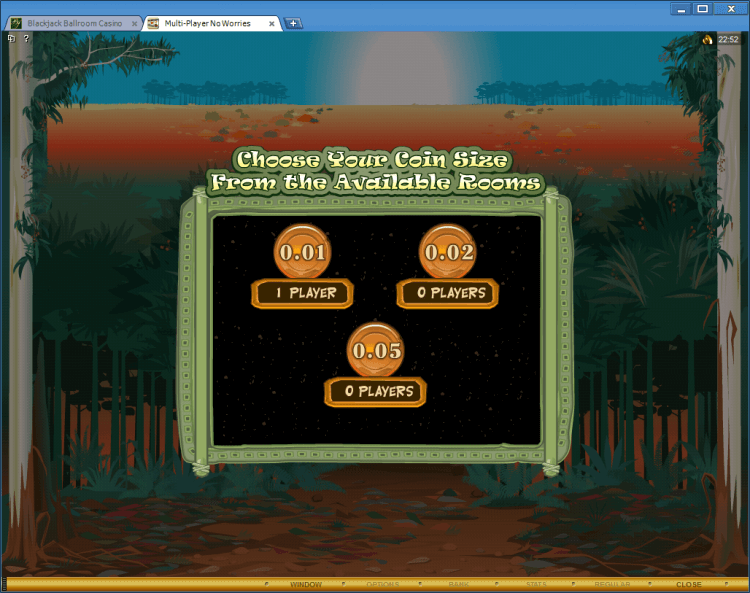 At first you need to choose your coin size, I choose 0.1, because there was one man. In this slot you can chat and upload your own avatar. Multi-Player Slots are community slot games where players play in a common game room, without competing against each other for any prizes. During the game you have one alias across all casinos you are registered at. You can’t have multiple aliases. As you see at the pictures, there are some time showing. You must spin the reels within the two minute time limit. The No Worries symbol is a wild symbol. This symbol creates its own winning combination when multiple symbols appear in a line on an enables payline. As you see, this symbols are in the two sides up of my slot reel, and they bring to me 0.21 coins win! The Boomerang symbol is a scatter symbol. This symbol completes a winning scatter combination when two or more appear on the reels. My time limit is end and at the end I won 0.17 coins. 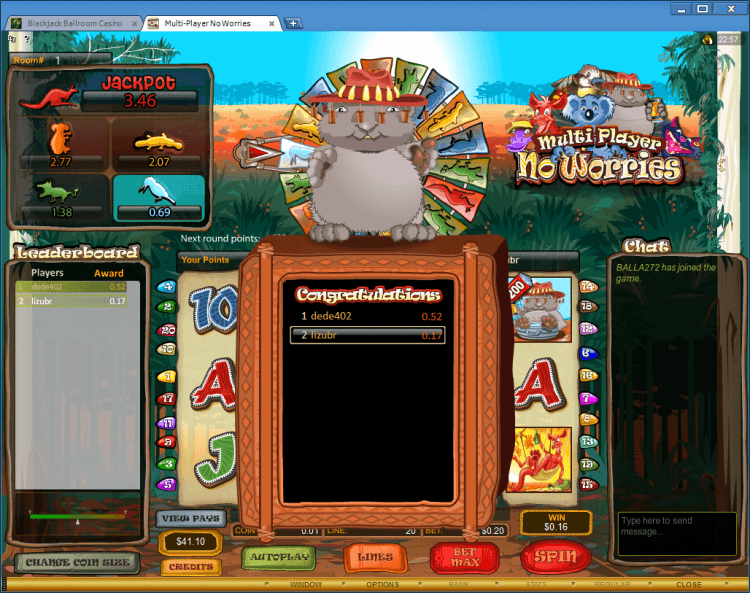 The Progressive Jackpot bonus round activates when the progressive count-down reaches zero.